FuzzMeasure is an audio and acoustic measurement tool to produce, analyze, and publish beautiful graphs. It delivers a comprehensive suite of features for professionals in research, acoustics, live sound, room design, and pro audio. By combining sophisticated technology with an elegant user interface, FuzzMeasure offers an unparalleled experience. To be able to show both the Waterfall and Reverb Time (RT60) graphs at the same time [in FuzzMeasure 4], without having to close one and then open the other, will save a lot of time as far as them grasping the scope of problems in the space. I’m not a trained acoustician, I’m an audio engineer. I'm not the guy designing rooms on a piece of paper, but I can tell you if a room sounds good or not. That’s why I like FuzzMeasure. A lot of clients just want you to tune the room fast and FuzzMeasure has definitely expedited the process. A lot of mastering engineers don’t do their own room scans however I feel that you have to know how to do your own work in case something gets accidentally moved or bumped. Before FuzzMeasure, I did all this by ear. FuzzMeasure is one of the many helpful tools I use to do my job effectively. FuzzMeasure contains an all-new graphing system that looks amazing on Retina displays and allows you to view and store any combination of graphs within a document—including Waterfall and Reverberation Time! FuzzMeasure's graphs draw whichever measurement records you select. Want to graph the left speaker? Select that measurement. The right? Select that one instead. Need a comparison of the two? Select both! 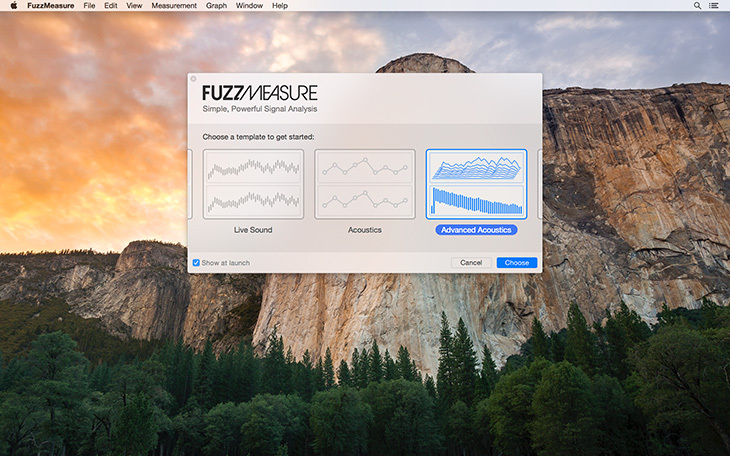 As always, FuzzMeasure makes it simple to capture your measurements with a single click. Whether you are attaching an array of 8 microphones or just one, FuzzMeasure is quick and easy to use. With only a spare patch cable and a free input and output channel on your audio hardware, FuzzMeasure can quickly correct both time and frequency issues to help you get spot-on timing information when delay-finding. 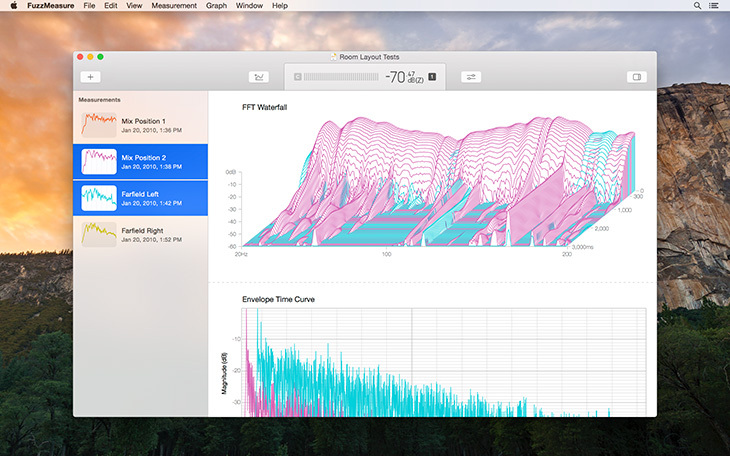 FuzzMeasure renders its graphs so they look excellent on a Retina display or in published materials. FuzzMeasure now offers more export configuration including exports for high-resolution web publishing. FuzzMeasure's native support for Core Audio means that FuzzMeasure offers support for multichannel recording and playback as well as measurement sample rates up to 192kHz on any hardware that supports it. 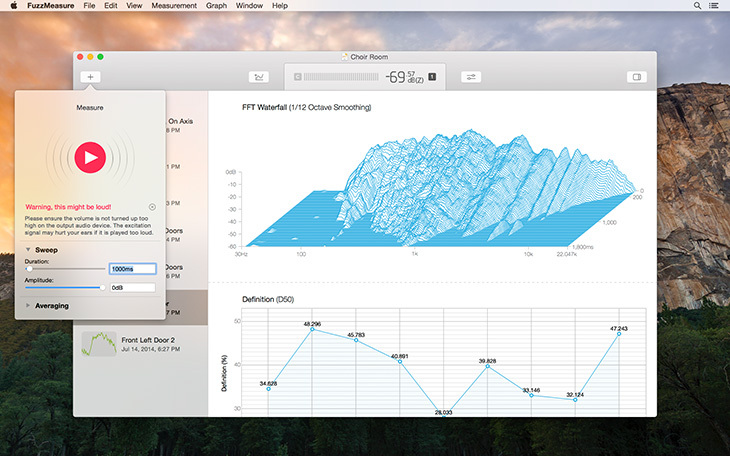 FuzzMeasure's all-new Waterfall graph looks outstanding on Retina displays, and is built with high-resolution publication in mind. Now with adjustments for the windowing function as well as the FFT length used during calculation. 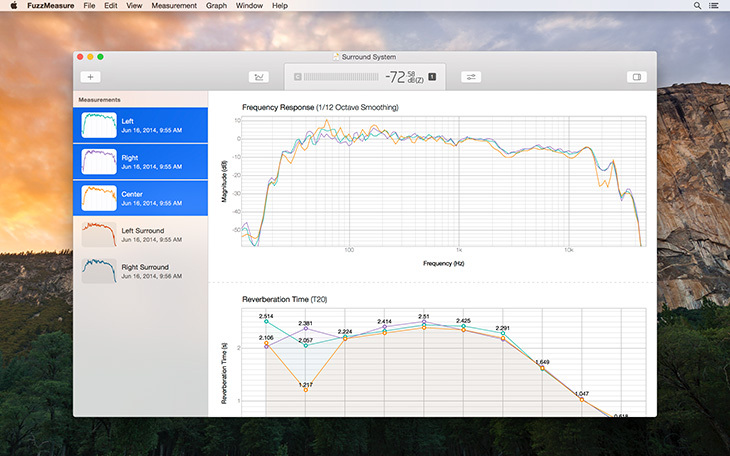 With an all-new bar and line graph design, FuzzMeasure also adds Clarity and Definition calculations for acoustic measurements in addition to Reverberation Time (RT60) and Early Decay Time (EDT) graphs. Trigger measurements, automate the export of impulse response data for external analysis, and much more. Now you can also export graph data, including the result of comparisons, and with fractional octave smoothing. FuzzMeasure's all-new Commercial License offers industry users with the kind of support they need. We'll do our best to help you out with automation, hardware integration questions, and much more.